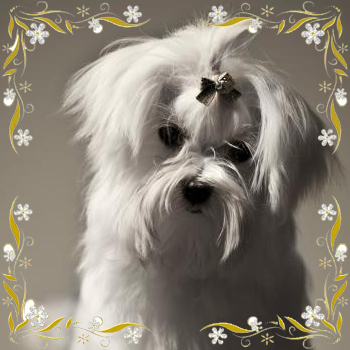 Their name does not mean that this breed originated in the island of Malta, because the adjective « Maltese » comes from the Semitic word « màlat » which means refuge or harbour; this Semitic root comes up again in a whole series of names of maritime places; i.e. in the name Adriatic island of Méléda, the Sicilian town of Melita and also in that of the island Malta. The ancestors of this little dog lived in the ports and maritime cities of central Mediterranean, where they hunted mice and rats which were found in profusion in the harbour warehouses and in the hold of ships. In a list of dogs existing at the time of Aristote (384 322 B.C.) he mentions a breed of little dogs to which he attributes the Latin name « canes melitenses ». That dog was known in Ancient Rome: favourite companion of the matrons has been praised by Strabon, Latin poet of the first century A.D. Representations of the Maltese by numerous Renaissance painters show this little dog in the salons of the period at the side of beautiful ladies of the time. Muzzle : Length of muzzle is equal to 4/11 of the length of the head; it is therefore slightly less than its half. The suborbital region is well chiselled. Its depth is a good 20% less than its length. The sides of the muzzle are parallel, but the muzzle seen from the front, must not appear square, since its anterior face joins onto the lateral sides by curves. The muzzle is rectilinear with a well marked furrow in its central part. Upper thigh : Hard muscled, hind edge is convex. Parallel to the median plane of the body, its downward and forward direction is somewhat oblique in relation to the vertical. Its length is nearly 40% of the height at the withers and its width is a little less than its length. · Length of body exceeding 43% of the height at the withers. · Accentuated undershot mouth, if it spoils the outer appearance of the muzzle. · Size in males over 26 cm or below 19 cm. · Accentuated divergence or convergence of the head planes. · Total depigmentation of the nose or nose of other colour than black. · Total depigmentation of the eyelids. · Tail-less, shortened tail, whether congenital or acquired. · Any colour other than white, with exception of pale ivory. · Patches of different colours whatever their extension.